If you can see past its flaws, the Liquid Jade S offers some of the best performance and build quality of any affordable dual-SIM smartphone. While the name 'Acer' is one more synonymous with desktop and laptop computers, over the past couple of years the Taiwanese company has released some solid budget and mid-range smartphones, such as the Liquid Z4 and E3. Acer, like a number of other Asian smartphone manufacturers, is continuing to push the boundaries in regards to value for money, recently showcasing four upcoming budget-oriented devices at MWC 2015, including the promising Liquid M220 and Jade Z. Last year, it was in the mid-range category where Acer showed signs of progress, giving us the curvaceous Liquid Jade. While at the time it was the firm's best shot at a smartphone, a number of gripes, including underwhelming performance, prevented Acer's flagship from really competing outside of Asia. This year's iteration, the Liquid Jade S, looks to boost performance without altering the overall design of its predecessor. The Liquid Jade S retains the 5-inch 720p display from the Jade, covered by a single piece of curved Corning Gorilla Glass 3, with the same 13MP rear snapper with LED flash combo around the back. Inside, Acer has added a more powerful Mediatek MT6752M processor with 2GB RAM and 4G LTE, and upgraded the internal storage to 16GB with the option to expand by a further 32GB via a MicroSD card. Unlike many of their Chinese counterparts, the majority of Taiwanese Android smartphones come with Google apps and services such as the Play Store pre-installed. 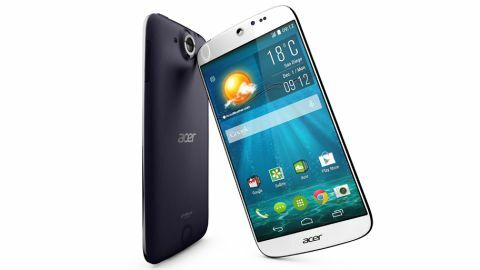 The Acer Liquid Jade S is no exception and a SIM-free model can be snapped up for £229.99 (around $336, AU$438). While on paper the specs have seen a welcome upgrade from the original Liquid Jade, it remains to be seen how the Liquid Jade S fairs against current mid-rangers such as the Honor 6 and the Oneplus One. Acer has really thrown the cat amongst the pigeons here. It's rare to see a smartphone in this price category with such a slick and minimal design. At just 120g, the Liquid Jade S is incredibly light. While the aesthetics won't appeal to everyone, the flowing curves are more than merely aesthetic and contribute to a superb in-hand feel. An Acer logo, an earpiece somewhat reminiscent of a watering can rose and a 5MP front snapper are the only noticeable elements on the face of the Liquid Jade S. Proximity and ambient light sensors, as well as an LED notification light, are hidden away under a single piece of Corning Gorilla Glass 3, which tapers gently into the faux-chrome surround. Despite the 5-inch IPS display having a resolution of only 1280 x 720, resulting in a pixel density of 294 PPI, text and images look crisp. Viewing angles are also impressive with little-to-no colour shifting and thin bezels helping to create a pleasant, immersive viewing experience. There's very little to see on the bottom edge of the Liquid Jade S, with Acer keeping things minimal once again. The microUSB port takes up a wide position flanked by a single microphone, which sits precariously close to one of the many rounded corners. The dual-SIM card and microSD card slot is located on the left-hand side of the Liquid Jade S, with the volume rocker on the right. In terms of positioning, the volume keys are perfect. However, they feel rather cheap when pressed, giving off a far from confidence-inducing click. The volume '-' key also has a habit of sticking, which doesn't bode well for longevity. Although the Liquid Jade S is not particularly tall for a device with a 5-inch display, it is still a little awkward to reach the power button on the top edge. Thus, as when using the HTC One M8, some hand-gymnastics will be needed for those with small-to-medium sized hands. Fortunately, the power button is considerably better feeling than the volume rocker, and while not stellar, it does provide a certain amount of tactile feedback. Around the back, the Liquid Jade S retains the protruding 13MP camera and single LED flash combo from the Liquid Jade. Acer has decided to do away with the silver ring around the outside of the camera lens, resulting in a more polished and understated look. The Acer branding, DTS-HD logo and spherical speaker also return from the Liquid Jade, but the Taiwanese firm has decided to tone down the overall appearance of the rear. Instead of using the same glossy plastic as the Liquid Jade, the Liquid Jade S features a matte brushed metal-effect finish. As well as being less of a fingerprint magnet, the matte rear makes for a much improved in-hand feel. As you'd expect, even with curved Corning Gorilla Glass 3 on the front and durable matte plastic around the back, the Liquid Jade S still feels a lot less premium than metal/glass flagships such as the HTC One M9, Samsung Galaxy S6 and the iPhone 6. Nevertheless, for an affordable mid-range device, the design and build of the Liquid Jade S is impressive. If the black Liquid Jade S is a little too understated for your liking, white, pink and red variants are also available.